The LG G3 is one of the best Android smartphones available, overtaking the competition with its gorgeous Quad HD display in an almost bezel-less package. Of course, it’s not all about hardware with the G3, as LG has provided many great software features, too. If you’re a new LG G3 owner, these quick and simple tips will help you get the most from your awesome phone. Dual Window lets you run two apps side by side with ease. 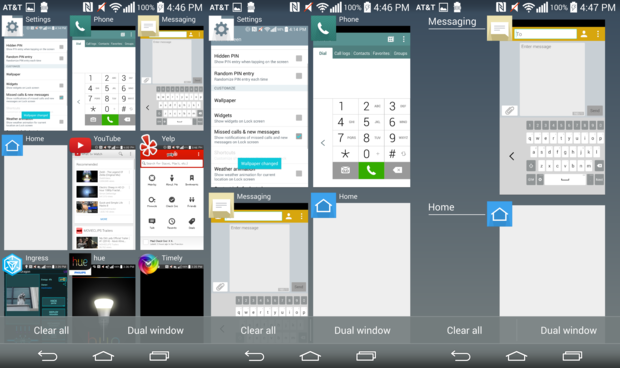 LG has given their recent devices the ability to run two apps side by side, at the same time. This feature may be limited to only a handful of apps, but it can most certainly come in handy when trying to multitask. 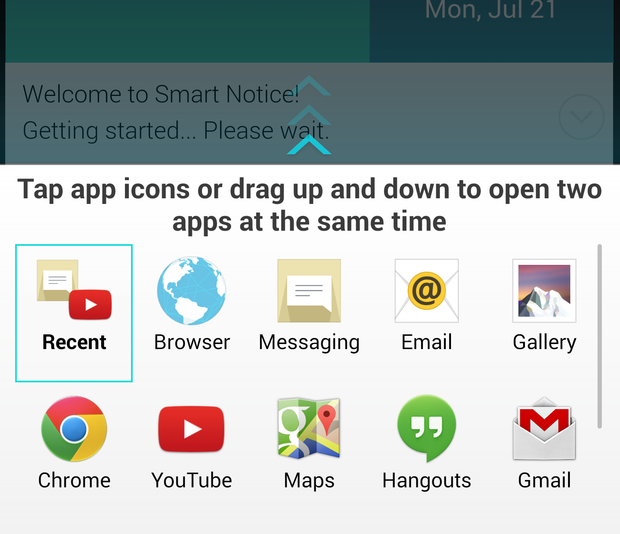 To access the Dual Window feature on the LG G3, hold down on the back button, and a menu (above) will pop up with a list of apps. From there, you can drag one app to the top and one to the bottom. The combination of apps will be saved for later use. A few apps can even interact with one another. For example, if the file manager and messaging app are opened in Dual Window, you can easily drag a photo from the file manager into the messaging app. 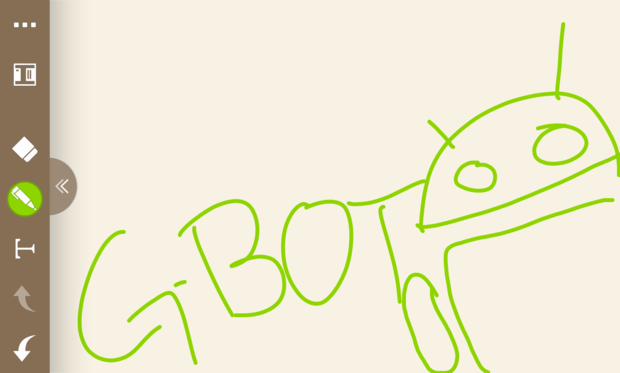 QMemo+ makes it easy to jot down a quick note or draw a bad Android figure. QMemo debuted on the Optimus G, and it still remains a useful feature in the LG G3, Using a similar gesture to accessing Google Now (swipe up from home), QMemo is also available by swiping diagonally up and to the right. Alternatively, the feature is also available by holding the volume up button when the G3 is in its locked state. QMemo allows you to take a screenshot of whatever the current screen is being displayed, and you’ll immediately be able to jot notes down via text or by drawing directly on the screenshot. You can also choose to switch to the “Paper” view, which gives you a blank canvas for notes and doodles. Possibly the simplest use of QMemo+ is its ability to take screenshots, offering an alternative to the volume down and power button combination that can sometimes be a bit tricky to pull off. Too many options in the quick settings menu? Change and rearrange options to get whats important to you front and center.LG has provided quick settings options in the notification panel for some time now, and it’s incredibly easy to customize.With your notification panel open, swipe through the quick settings options until you see the Edit icon at the very end. From here, you’ll be given a list of the options that can be displayed in the notification panel. Each option has a checkbox to the left of it and three lines to the right of it. Checking a box will show the option in the notification panel and un-checking it will remove it. If you want to change the order of notifications on the panel, touch and drag it to the position of your choosing and it will be reflected in the Quick Settings panel immediately. More buttons! Get quick access to your notification panel and QMemo+ by adding more buttons to your navigation bar. While LG defaults to the same navigation bar layout as stock Android, you can add a few extras to it and even change the theme. In fact, you can have up to 5 buttons on the navigation bar. 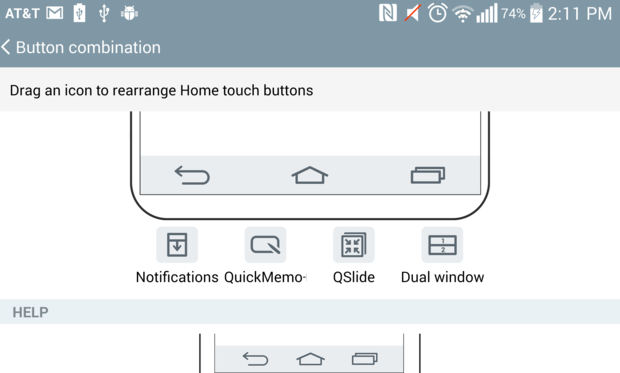 Additional buttons for the notification panel, QMemo+, QSlide, and Dual Window are the only options available, so don’t get your hopes up for the ability to have a custom app on your navigation bar. You can also drag around the icons to change the order. While limited to only four options, users can also change the theme of the navigation bar. You can choose white or black, each of which has a gradation theme. It’s nothing terribly special, but it’s a nice touch. To change the navigation bar, go to the Display tab in the settings menu and tap on Home touch buttons. Setting up Knock Code is very easy, and you’ll have a backup pin just in case you forget it. 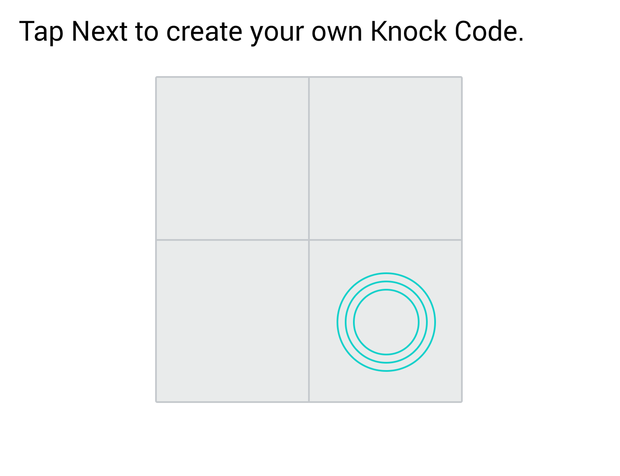 Knock Code is an interesting and innovative feature that makes a great alternative to the recent additions of fingerprint sensors in a few smartphones today. Knock Code debuted on the LG G Pro 2 and allows you to create a “code” in the form of a combination of taps on specific areas of the screen. If you don’t want a password, pin, or pattern to unlock your LG G3, Knock Code is where its at. Best of all, you can use Knock Code while your phone is asleep to immediately jump into the phone without having to turn the screen on, then enter your password. Under the General tab in the settings menu, go to Security > Lock Screen > Select screen lock. Select Knock Code and you’ll then be asked to create and confirm a Knock Code pattern. The setup will also require you to create a backup pin in case you forget your knock code. Get some peace of mind when handing over your phone to someone else with Guest Mode. Guest Mode lets someone else use your phone without getting full access to your files, photos, and other private content. The feature allows the owner to set a specific unlock pattern, as well as select what applications are available in this mode. This limited functionality can be useful if you have sensitive information on your phone, or want to restrict the apps they have access too, like kid-safe games for your child. To enable Guest Mode: Under the General tab in the settings menu, tap on Guest Mode. 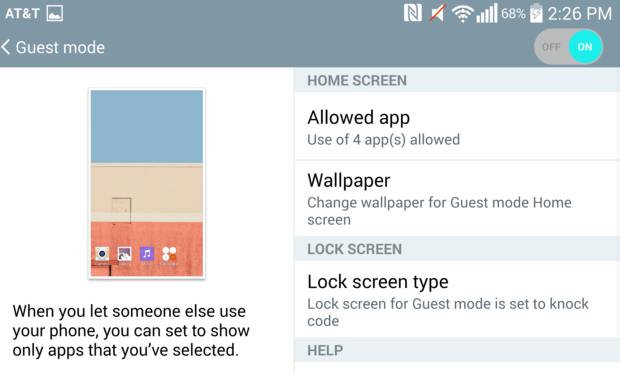 From there you can select which apps Guests will have access to, change the wallpaper, and select the lockscreen type. When the other person unlocks your LG G3 with the designated Guest Mode code, they’ll be in the walled garden you have sculpted for them. Changing the system font on the G3 only takes about three taps. If you’re looking to liven up your homescreen experience or want a more playful font spanning across most of your apps, LG provides an easy way to do both. When you change the system font on the LG G3, the new font will be displayed, well, system wide. This means all the text in your status bar, your messaging app, basically everything will be changed. 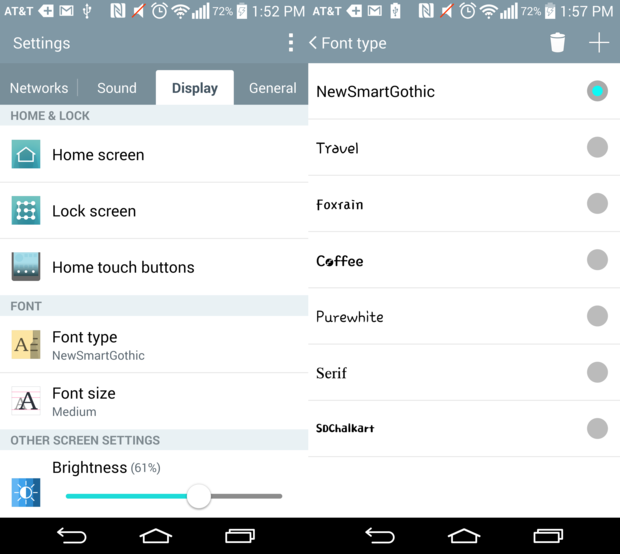 The pre-installed options for system fonts are kept at a minimum on the LG G3, but more are available to download with the LG SmartWorld app. Under the Display tab in the settings menu, tap on Font type and select your font. After you change the system font, you can also change the Home theme the same way by going to the display settings and tapping on Home screen. Wield the G3 with one hand with One-handed operation. The LG G3 is a powerful smartphone with great features across the board, but there’s no denying that it’s a big phone. Unless you have very large hands, you’ll likely use it with two hands. Luckily, LG has a feature to help alleviate this problem, called One-handed operation. 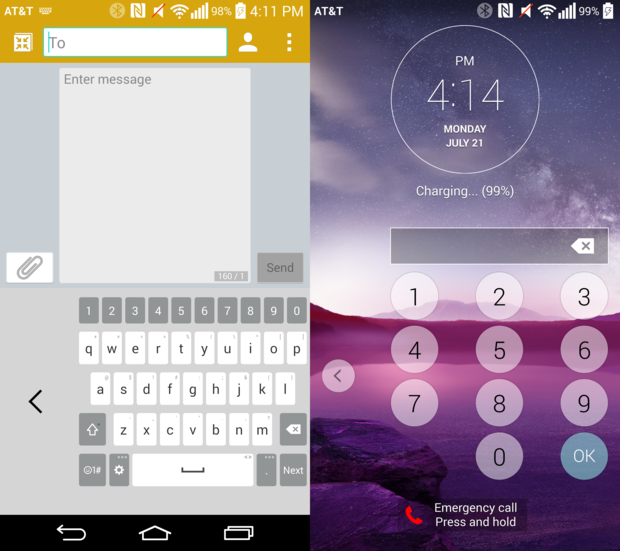 With One-handed operation enabled, you can adjust the alignment of the dialer, keyboard, and lock screen, making them easier to use with one hand. Under the General tab in the Settings menu, tap on One-handed operation. Check the boxes for the features you’d like to enable, and you’re good to go. Looking for a quick way to shoot a photo or take a note? The LG G3 has you covered. While the phone is in its locked, sleeping state, you can launch the camera by pressing and holding on the volume down button. Holding down on the volume up button while the phone is locked will launch the QMemo+ app. This is a pretty cool feature to have at your finger tips, but the downside to the shortcut keys is that there is no way to change which apps they summon, so you’re stuck with Camera and QMemo+ whether you like it or not. The only option, found under the General tab in Settings, is to disable the shortcut keys completely. One of the LG G3’s new features is called Smart Cleaning, and it will remind you to delete apps apps you don’t use and other data to free up space on the phone. Smart Cleaning will remind you to delete temporary files or items found in the download folder after a certain amount of time. It will also suggest you delete cache from apps, temporary Clip Tray files, and apps that haven’t been used after a certain amount of time. By default, both the notification interval and idle time period is set at 1 month but both can be reduced or lengthened. Smart cleaning settings can be found under the General tab in the settings menu. A quick pinch gesture is all it takes to change the view in your recent apps menu, gallery, and messaging. One nifty feature that is easily missed on LG smartphones is the ability to grow or shrink the view of certain applications. Previously, the feature was limited to the Gallery and Messaging apps but the latest software on the LG G3 brings the same function to the recent apps menu, too. In any of the three supported apps, you can shrink or grow the app’s view with a simple pinch in or out gesture. The gesture shrinks or enlarges text in the messaging application, increases or decreases the number of viewable apps in the recents menu, and changes the thumbnail size of albums in the gallery app. It’s hardly a game-changing feature, but it’s definitely a nice option. Make LG Health an icon instead of a large widget with this workaround. LG Health is a handy app that lets you track your steps, exercise stats, and even map out your path during a run. Unfortunately, the the only way you can get to it is through a widget on your home screen. This also means that you won’t find LG Health in the app drawer at all. Luckily, with a third-party app, you can create an icon for LG Health easily and free up some home screen space. Download QuickShortcutMaker from the Google Play Store. Open QuickShortcutMaker and search for LG Health. When the result populates, tap on the downward-pointing arrow to reveal the app’s activities. Tap on com.lge.lifetracker/com.lge.lifetracker.MainActivity. To test the shortcut, you can tap on the Try section on the next screen. Tap on Create and LG Health will appear as an icon on your home screen. 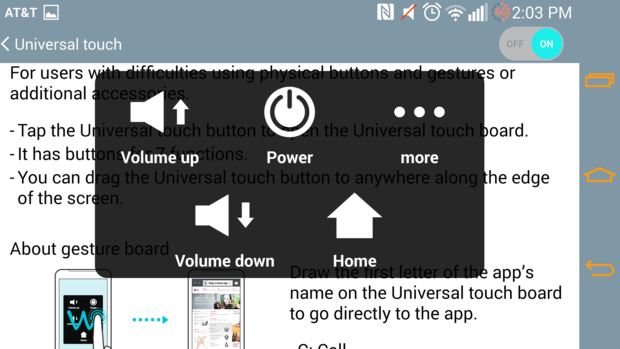 The accessibility settings menu on the LG G3 is full of little tweaks that you may not be aware of. Touch Zoom allows you to tap three times on any area of the phone, with the exception of the keyboard and navigation bar, to zoom in. Once in this zoomed-in mode, you can pan by dragging two fingers around and adjust the zoom with a pinch gesture. Another three taps will bring you back to the standard view. Flash alert is exactly what it sounds like: the camera flash will light up when incoming notifications and calls arrive. Helpful when you’ve lost your phone or just to add some blinding flair. Get quick access to frequently-used phone features with Universal Touch. Universal Touch enables an always-on icon that will be available across every screen of the phone. Tapping the icon brings up a large window in the center of the screen, offering up basic functions for volume, power, home, screen capture and settings. You can also launch apps for settings, calling, messaging and browser by drawing the first letter of the application’s name on the open Universal Touch window. 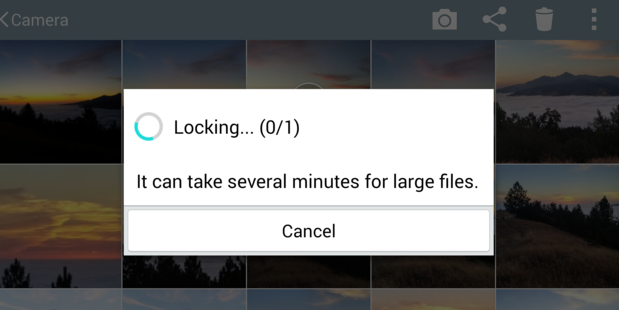 If you have sensitive photos or videos that you want to make sure nobody can access but you, LG provides a way to lock them behind a password with its Content Lock feature. Before you start locking away your selected content, you must first set up a password. To do this, go to Settings > Security > Content lock. It will ask whether you want to set a password or a pattern and to provide a valid email address in case you lose it. From there, you can go into the gallery app, tap on the action overflow (three vertical dots) button on the top right and tap on Lock. Select the content you want protected, and it will be hidden, accessible only by your password. Unless you disable it completely, you probably look at your phone’s lock screen several times a day. If you need to spruce it up a bit, head over to Settings > Lock screen to get your tweak on. This menu will allow you to change the type of lock screen, wallpaper, unlock animation, and your shortcuts. You’ll also be able to enable lock screen widgets here, so I suggest you spend some time getting to know this menu well.